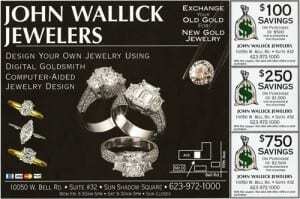 John Wallick Jewelers is your local jewelry store near Phoenix, Arizona. We provide appraisals, remounts and jewelry repair, carry an assortment of dazzling jewelry, diamond engagement rings, wedding bands and develop handcrafted, custom wax carving designs. We buy & sell gold, gemstones, jewelry and estate jewelry. 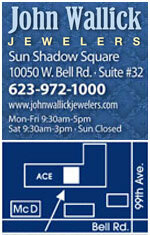 John Wallick Jewelers is located in Sun Shadow Square at 10050 West Bell Road, Suite #32, Sun City, AZ, 85351. We are your Arizona Jewelry store servicing residents living in Phoenix, AZ, 85003, 85004, 85006, 85007, 85008, 85009, 85012, 85013, 85014, 85015, 85017, 85019, 85020, 85021, 85022, 85023, 85024, 85027, 85029, 85032, 85034, 85035, 85040, 85041, 85042, 85043, 85045, 85048, 85050, 85051, 85053, 85054, 85083, 85251, 85254, 85255, 85282. John Wallick Jewelers is open 9:30 A.M. to 5 P.M. Monday – Friday and 9:30 A.M. to 3:00 P.M. Saturdays. We are closed on Sundays.